What Happens to Your Building After a Snow Storm? During severe weather, your St. Charles, MO, business may be more likely to experience damage to its premises. One thing that can cause a problem is the formation of an ice dam. This seemingly innocent product of melted snow can cause costly damage. Here is what happens to your building after a snow storm. During a snow storm, quite a bit of snow can accumulate on your building’s roof and gutters. 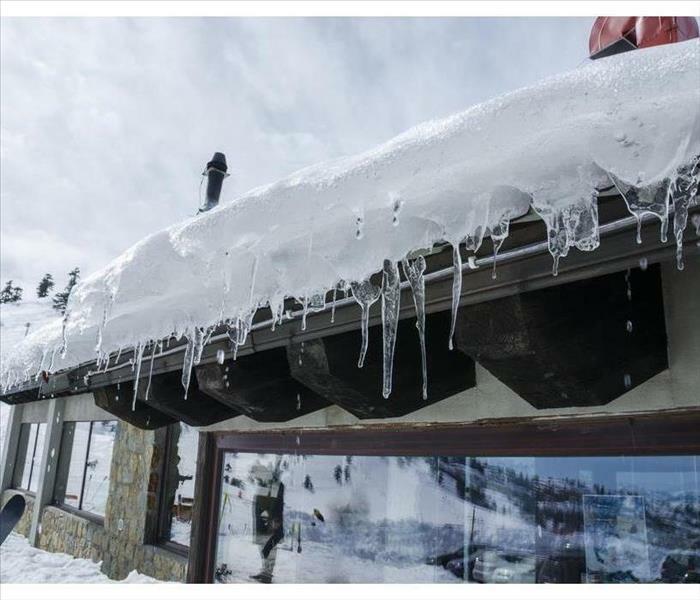 Heat from inside of the building or from the weather warming up can cause the snow to melt and then reform as ice. The buildup of ice can prevent the rest of the snow from draining properly as it melts, which can cause damage to your building. As the snow begins to melt, because the ice dam prevents it from draining, it can begin to trickle down inside of the walls of your building. As this continues, it can cause damage to walls as well as create the right conditions for a fungus, such as black mold, to form. As the water creates moisture inside of the walls, fungus can begin to grow within the day. After just a short period, you might be left with a big problem that requires professional mold cleanup. The mold will continue to spread as long as the moisture is not removed. If you believe that a growth has formed, you should take action immediately. Mold spreads very quickly, so the best way to keep your building mold-free is to remove the snow and ice from your building before it causes any damage. If you are unable to do so and an ice dam causes leaking and mold, you should hire a mold remediation service to take care of it as soon as you can. If you have a commercial water loss in St. Charles, MO, SERVPRO of St. Charles City is the premier restoration company to help you from start to finish. 1. Initial Assessment: This can include the initial walkthrough and determine what needs to be done from start to finish. Typically a scope of service will be written. 2. Immediate Emergency Services: SERVPRO of St. Charles City will begin extracting and removing water from the facility. 3. Drying: SERVPRO will place drying equipment throughout your facility. Each day a member of their team will check on the progress until the structure is dry. If you have a fire in your business, it can create a stressful time for you and your team. Luckily, SERVPRO of St. Charles City is here to help from start to finish. Our goal is to get your property back to pre loss condition as soon as possible. The first step is for SERVPRO to perform the initial emergency services. Once all of the water and damaged materials are removed from the fire, SERVPRO can begin the cleaning process. Each fire job can be different, so it is important to follow all guidelines set forth by the IICRC. SERVPRO takes great pride in documenting each step of the project so you have accurate records of you job for your insurance company. If you have any questions, do not hesitate to reach out to us at anytime. Can SERVPRO of St. Charles City help with a large commercial loss? The answer to that question is absolutely yes. SERVPRO has more equipment and manpower than any company in the St. Peters and St. Charles area. If you have any questions, do not hesitate to reach out to us at anytime. Every loss can be different, so it is important to make sure that a trained company like SERVPRO assesses each step of the job to make sure the proper steps are taken. It is important to make sure that plenty of notes and pictures are taken throughout the project. This can help if there are any issues with your insurance company along the way. If you have any questions, please do not hesitate to reach out to us at anytime. SERVPRO of St. Charles City is the best choice when it comes to choosing a disaster restoration company. If you own a large or small business, SERVPRO understands the importance of keeping your doors open and minimizing downtown in the nature of a catastrophic event. Our team is faster than any other restoration company in the St. Charles City region. Our technicians and managers are trained and certified to handle any type of water, fire or mold damage. We pride ourselves in being an educational resource to help your from start to finish. Documentation throughout any large project is a priority that we take seriously. We want to make sure that you have the notes and documentation for your records in case you have any issues with your insurance company. 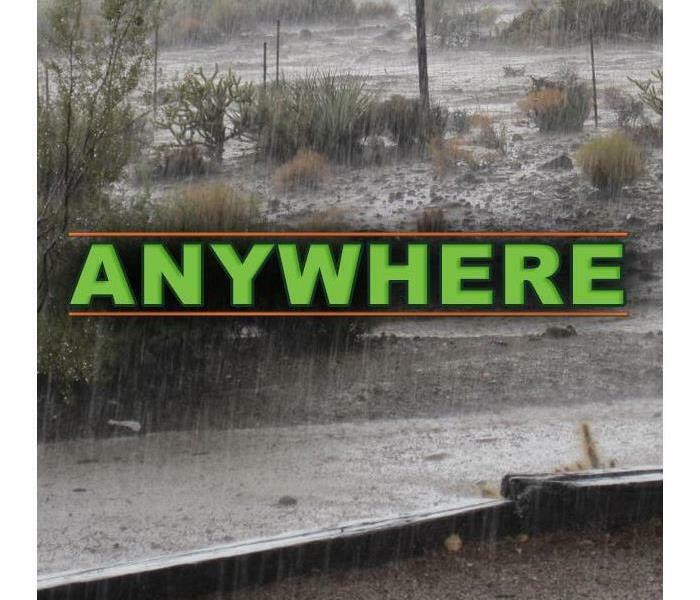 If you have any questions, call SERVPRO at anytime day or night. Imagine if a three-foot wave of water hit Portage Des Sioux,MO. The business documents, company records, and personal keepsakes that would be impacted by the water would be tremendous. Many of the documents can be critical to the every-day business of companies, while other documents, such as tax records or credit and debit accounts would be very difficult to replace. If you find yourself, or one of your insured in need of document restoration services, turn to SERVPRO to help you restore those valued items. Even 30 years ago, if a valuable paper item was flood damaged, it was considered an insurance write-off because most of the time it could not be restored. Not only were the pages bacteria infused, but the dirt and chemicals could not be removed. can be put through a document drying process and restored to near pre-flood condition. The advanced technology is the same one the Library of Congress used to remove mold, bacteria, and dirt from their most valuable documents. There are two methods of document restoration often used by SERVPRO technicians. The first is making a digital representation of the document. This saves space and keeps them safe from future damage. The second is the freeze-drying method mentioned above which extracts all the water from the damaged documents while keeping the pages intact and doing so without the brittleness that often accompanies water soaked papers. How Does Restoration Help You? Whether you are an adjuster, insured, or company owner, SERVPRO’s document drying can save you money because they process the documents themselves. The technicians have been trained with the latest equipment available, and they can work quickly and efficiently to get the job done. You can trust this reputable company with your document restoration needs. Give them a call and find out what services they have to offer. Water from a storm or pipe burst is often the cause of home damage, but it is likely that you don’t know all there is to know about this common problem. Here are a few things to keep in mind in the event of water damage to your Weldon Spring,MO home. There are many things that can cause water damage. In the winter, frozen pipes can break, and snow or ice can cause damage to your roof and create a leak. A broken water line can also cause quite a bit of damage. Water can also come from a smaller source, such as a leaky pipe or cracks in the walls. Depending on the source of the water damage, you will not always be covered by your insurance. One example is if you have failed to maintain your home properly and a broken pipe or appliance is found to be caused by negligence. Another instance when you will generally not be covered is if the damage is caused by flooding. Most homeowners policies do not cover this type of natural disaster, and you will need to have a separate flood policy. Even if the source of damage seems insignificant, you should have it dealt with right away. A leaky window may not be as much of an emergency as having a pipe burst, but if it is ignored, the water damage will only worsen. Water can cause building materials to warp and can contribute to the growth of mold inside of your walls and flooring, so it should be taken care of as soon as you notice it. Whether a pipe burst or a leaky roof has let in moisture, a professional water damage remediation service can help. They can repair both the source of water in your home as well as the resulting damage. If you notice water in your home, do not hesitate to get it fixed. Why Does Food Get Moldy? You open up your bread box, and the musty smell hits you. Then you get visual confirmation as you pull the loaf of bread out of the box. You have bread mold. Understanding how mold growth in food happens can help you store food differently and thus prolong its life. There are three main elements that contribute to moldy food. Mold thrives at room temperature. If your bread is in an open container without being sealed, spores from the air can settle on its surface and begin to grow quickly. You can slow down the fungus growth process a little by storing food in a sealed bag, but mold can still get in. In fact, if the temperature in the room is too warm, plastic wrap may act as an incubator for mold. Another key contributor to bread mold growth is moisture. 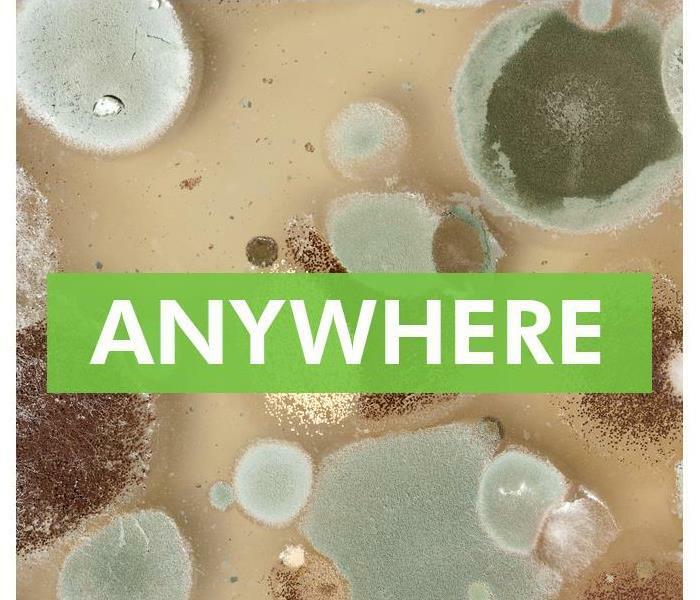 A wet surface is particularly inviting to spores, which is why mold remediation specialists always seek to dry out an area with water damage before trying to clean it. This is why fridge mold occurs, despite the appliance's cooler internal temperature. The cooler air may slow down the growth, but eventually, the moisture creates the perfect home for mold. Bread and other foods often mold because the fungus feeds off the nutrients in these items. Warmth and moisture alone are not enough to sustain a patch of mold. It must have sustenance, and bread is the perfect meal for it. Because it does not derive any of its nourishment from the sun, mold depends solely on organic matter to feed itself. Many surfaces in your home in O'Fallon,MO, are susceptible to mold growth, and your food is no exception. By understanding how bread mold forms, you may be able to adjust how you store it so that you can make it last longer. Insurance claim services require many things from homeowners as far as paperwork and proof of damage, but not every owner is prepared to provide these details and may even struggle to focus after experiencing a disaster. Therefore, it can be up to an insurance agent to guide clients through the process by making suggestions as to what comes next. One of the most significant suggestions you can make to a distraught client is that of a disaster restoration specialist in the St. Peters,MO, area, like SERVPRO. These companies will help to guide your client through the process while simultaneously making the claims process easier for you. A potential misstep for clients without guidance is a lack of an emergency response regarding mitigation practices. The proper care of the damaged property is pivotal to claims approval. If a client fails to prevent further damage, then they put the whole restoration project in jeopardy. 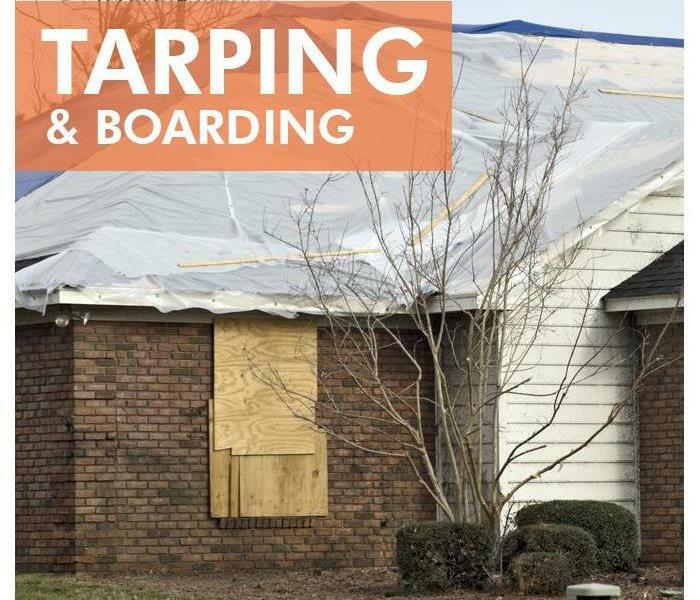 Therefore, you should share the importance of board-up and tarping services provided by restoration companies. Another vital aspect of the claim services process is the proof of loss statement. This statement provides a record of all lost and damaged insured items. Restoration companies can help with this process by thoroughly cleaning the residence, making sure that all damage is visible and brought to the homeowner’s attention. Once you have filed a claim on behalf of your client and the funding is approved, the restoration work can begin. This is an exciting time for most clients as they start to see the reality that their home will be their home again. The claim services process is difficult and time-consuming, but when that process is combined with devastated clients, it becomes that much more trying. During these difficult times, it is your job to help nudge clients in the right direction and toward competent specialists who will help both you and the client get through. Many cities throughout the world are aware of how devastating the damage caused by flooding can be. Whether they are located near large bodies of water or experience heavy rain on a consistent basis, there are several flood prevention methods engineers have used to protect the entire city. If your business in St. Charles, MO has seen its fair share of damage caused by high water and is only back in business due to the work of skilled storm damage restoration specialists, you might be wondering what tactics are actually effective at preventing floods. Here are three ways engineers have used to help prevent flooding in urban areas around the world. Many countries use various types of technologically advanced water barriers to stop high water in its tracks. Water gates, dams, storm surge barriers, and dikes are all methods used to keep the ocean from flooding the nearby city. Various advancements like aqua-drive motors and movable gates are increasingly efficient at stopping floods in their tracks. Since typical rigid draining systems are unable to deal with a large amount of water runoff or rainfall, one way to address urban flooding is to enhance these draining systems and make them more flexible. Some cities have even adopted sustainable drainage options by replacing impermeable surfaces like concrete with soil and plant life. Cities who experience frequent high water issues and flooding have begun to rethink how they construct buildings. From constructing buildings far above flood levels to using materials that are designed to withstand contact with water for long periods of time, there are ways to help businesses and homes better withstand the damage flooding causes. It is important that cities develop ways to stop flooding in order to protect its citizens and allow growth within the city. While there are many unique ways cities have battled flooding around the world, these three methods are a good place to start! 3/8/2019 - Why Does Food Get Moldy?